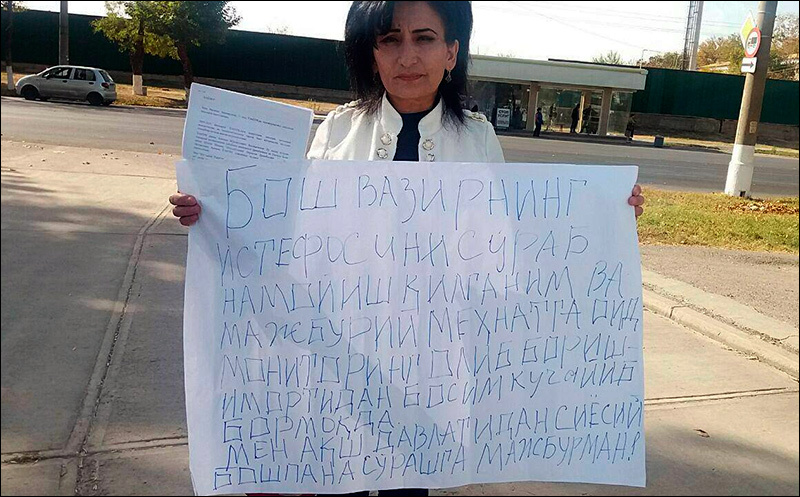 Uzbek human rights activist and a member of the "Besstrashnye" ("Fearless") group Malohat Eshankulova held a protest in front of the US Embassy in Uzbekistan on October 27, she reported on her Facebook page. The activist requests a political asylum in the United States because of increased pressure from the local authorities. Eshankulova links it with her activities to monitor the use of forced labour in the cotton picking and demands Prime Minister Abdullah Aripov to resign. Soon the US embassy staff met Eshankulova, listened to her accepting the statement. But the journalist continued to protest. She is ready to start a hunger strike in protest against the violation of her rights. In her post on Facebook, Eshankulova recalls that on 6 December 2010 together with TV journalist Saodat Amonova they protested against Abdullah Aripov, who at that time was vice-premier. "These protests cost us a lot," she writes. Journalists not only lost their jobs but also their residence registration in the Tashkent region. As a result, Saodat returned to Samarkand (they are both Samarkand born), and Malohat sued the decision. It turned out that somebody intimidated the owner of the house Isroil Isaev, where she had lived continuously since 1988 and had registered, that 'Eshankulova - the enemy of the people,' and he forced to deprive Malohat of a residence registration." In 2011, she managed to restore her permanent residence registration. "But then Aripov became prime minister, and the events of 2010 repeated," Malohat writes. On 26 October 2017, the inter-district civil court for the Zangiata district of the Tashkent region handed her a copy of the decision to terminate her permanent residence registration on 11 August. At the end of August, she temporarily registered with her daughter in the Chilanzar district of Tashkent, but the authorities also deprived her of a temporary residence registration fining her daughter by 1.5 million soms ($ 187). Eshankulova believes that all it is revenge for her activities as a human rights activist and independent journalist and suspects that Abdulla Aripov is involved in this. The human rights activist is in despair, as she lives in her homeland without a residence registration and causes trouble for her daughter. "They want to drive me out of the country to cover their tracks. That's why I'm asking for political asylum from the US government. I lived three-quarters of my life in the struggle, and I want to live the rest of my life as a normal person," she said. In 2016, Eshankulova appealed to the Constitutional Court and the Oliy Majlis (parliament) of Uzbekistan demanding to repeal the law on the residence in Tashkent and the Tashkent region, which is contrary to the Constitution and violates the rights of citizens of the republic. However, the parliamentarians ignored this appeal. Malohat Eshankulova is an independent journalist and human rights activist. She has been monitoring with her colleague Elena Urlayeva forced labour in the cotton fields and publishing reports on HimoyaUz website for several years. The police repeatedly detained the activists during the monitoring.